All of you who visited us at this year’s Light+Building in Frankfurt will remember we had some pretty amazing products on show. You may also remember one of the stars of our stand was LEIA, our newly developed lens providing a compact ultra-narrow beam for wall-grazing and decorative lighting. To many, a lens is a lens is a lens, until of course it forms part of a complete luminaire. As it is such a unique innovation for the architectural and lighting design market, we really wanted to show LEIA in action. To highlight how light can be so right from the people who make ‘Light that is Right’, so to speak. So we reached out to LTS Licht & Leuchten GmbH based in Tettnang, Germany. LTS are a member of the Swedish Fagerhult Group and produce extremely innovative, high quality luminaires and lighting solutions primarily for retail, hospitality and office environments. But they are also able to make custom solutions, which was what we were looking for. 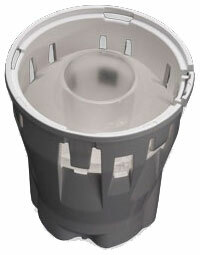 More than happy to help, LTS designed and manufactured a cylindrical luminaire for direct wall mounting. The design needed to reflect the narrow beam LEIA can produce and LTS managed to come up with something just 50 mm in diameter. Now slim and elegant is all very well, but the heat generated by LEDs requires cooling, and in a design so narrow, it just wasn’t possible to use a conventional cooler. So LTS fabricated the housing from high-grade aluminium, which acts as a cooler for the luminaire; very clever, just like LEIA. Originally designed as a custom solution for LEDiL, LTS have been so impressed with the end result they now intend adding this very special luminaire to their existing portfolio, and it should be available to their customers very soon. So if you are looking for a narrow beam wall-grazing or decorative lighting solution, you know where to call.